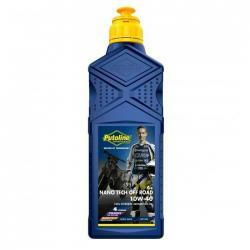 Nano Tech 4+ is the most advanced, 100% synthetic 4-stroke engine oil ever produced by Putoline Oil. The Nano Tech engine oils guarantee full compatibility with modern clutch friction materials and ensure an unsurpassed, correct clutch engagement. Available in a range of viscosities, 10W/40, 10W/50, 10W/60 and 15W/50, please choose your preferred one from the dropdown box. Supplied in a 1 litre bottle.